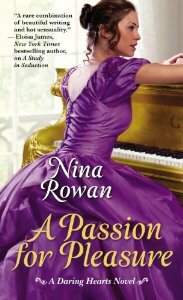 In the tradition of bestselling authors Elizabeth Hoyt, Victoria Alexander, and Madeline Hunter, Nina Rowan delivers the second provocative Victorian romance A PASSION FOR PLEASURE (Forever; Mass Market; April 30, 2013) in her Daring Hearts series. Risking scandal, ruin, and their own reputations, Sebastian and Clara enter into a marriage of convenience. But the pair soon discovers that their undeniable attraction is anything but convenient. Swept up in a crescendo of desire, Sebastian and Clara take each other to new heights of ecstasy–until secrets from the past threaten to doom the duet forever. Now Sebastian will have to change his tune–and prove his love is true.